the apparatus will last, the wearer regards the figure indicated by a gauge finger as the number of working time left in the apparatus. To cool the bag by admitting fresh oxygen quickly, when breathing becomes uncomfortable and warm, as is sometimes the case after say, 90 minutes work. The wearer can get any amount of oxygen through the by-pass valve so there should never be any fear of being overcome by over-exertion. When the bag becomes too hot, the hot air is first pressed out of the bag through the relief valve, and fresh oxygen, which is intensely cold through being suddenly released from compression in the cylinder, is admitted into the bag through the bypass. The arises from the chemical action of the caustic soda and the carbon dioxide, so that in a sense the heat is comforting, as it proves the carbon dioxide is being absorbed. The reducing valve, by Home Office orders, is set to deliver 2 litres, or about 122 cubic inches of oxygen per minute. This is considered by most rescue men, the writer included, to be too great a flow. 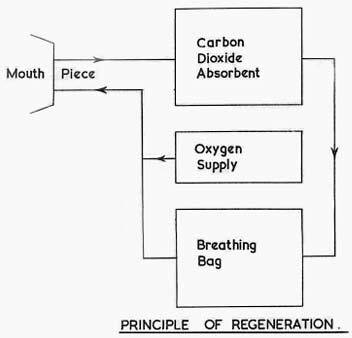 In theory it may be satisfactory but in practice it is found that the work which would cause the wearer to absorb two litres per minute is very rarely necessary, and the result is that for the greater part of the time the wearer is uncomfortable through his breathing bag being distended and he has constantly to stop working to press his relief valve to allow the accumulated oxygen to escape and so be wasted. The operations in all the disasters in North Staffordshire were carried out with the reducing valves set at 1.75 litres per minute up to the time of the Minnie Pit explosion in 1918. The majority of rescue men would be pleased to have the flow cut down to that figure again. During the long recovery operations following the explosion at Norton colliery about half the men engaged asked to be allowed to wear apparatus, which was giving only 1.5 litres per minutes. If the wearer needs any more oxygen for a short period of extra exertion, he can get it instantly from the bypass, so that it cannot be argued that he would be overcome by too much exertion. Further with a reducing valve set to deliver two litres per minute, only about 20 minutes supply of oxygen remains in the cylinder at the end of 2 hours, so that if there is any delay when the men are below, or they are temporarily trapped, there is but a small reserve to enable them to get out. The writer considers that on the whole much oxygen is wasted at the present rate, and there is not sufficient reserve for emergencies, or leakages caused by damaging the apparatus by knocking the valves when in use. This might easily happen, no matter how carefully guarded against, as when rescue men are needed, the roads in the pit are in a bad state. If it is necessary to work in smoke, the eyes are protected by goggles, which at present are the chief fault of the apparatus. There is a good opening for goggles, which will effectively exclude fumes from the eyes, give the wearer a good field of vision, and fit comfortable without causing headache. Perhaps the best type would be the sponge goggles, as in France as protection against tear gas, but they should for colliery work be fitted with splinter proof glass. Fogging of the pieces can easily be prevented by treating them with one of the numerous preparations for the purpose on the market. The nose clip question is a vexed one, everyone having a favourite type. The chief objection to the nose clip most used is that it liable to be knocked off by a blow from above. Clips fitted with rubber pads slip off when the skin becomes warm and moist. If they are tightened by screws, it is a slow procedure to replace them when they do fall off; and if the screw is so tightened that they cannot be pulled or knocked off, the result is that the nose is made to bleed, a very undesirable and painful state of affairs. The men engaged in the long operations at the Minnie Pit were all supplied with screw nose clips, as the type they were using fell off when knocked. In two days they all reverted to the old type and gave as their reason that when the screw clip fell off it was a long job to replace it, and they were constantly exposed too long to the gas, both hands being used to readjust it. Whereas when the old type came off, they could instantly grip the nose with one hand and replace the clip with the other in a matter of seconds only, one hand being sufficient to manipulate the clip, which will close the nostrils without injuring them or causing pain to the wearer, and at the same time remain securely in position without fear of slipping off.